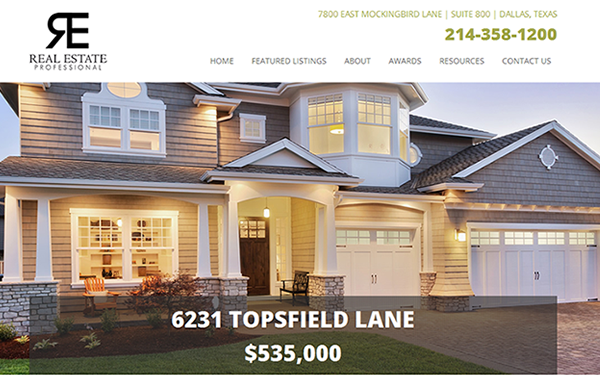 Real Estate Professional is a one-page HTML5/CSS3 Website Template with professional design and layout, and is built specifically to enable real estate agents or retailer to build their own brand and show hand-picked featured listings. Everything a real estate agent needs to build a sharp and professional website is included in the Real Estate Professional template. The Real Estate Professional template is built on the Twitter Bootstrap framework and is fully responsive so that it looks great on all devices. Property Showcase Slider – designed to showcase 1 or more of your listings. Agent’s Welcome Area – a welcome message from you to the visitor. Featured Listings Summary Block – a visual summary view of your featured listings. Featured Listings Detailed Item – stunning detailed listing presentation, including image gallery slider of each of your featured listings. About Section (Real Estate Agent Profile) – an area to describe your professional accomplishments, and inform prospective clients the advantages of the services you offer; your unique skills and passion; and industry experience. Awards/Associations Logo Display – a visual area for displaying professional associations you belong to, and well as for displaying industry awards and recognition. Resources Section – a compartmentalized area for displaying helpful/useful resources for your real estate clients. Contact Form – a working contact form with optional Captcha. Item Reviewed: Real Estate Professional Bootstrap Theme 9 out of 10 based on 10 ratings. 9 user reviews.